MEDFORD – Six members of the Tufts University soccer teams were honored when the National Soccer Coaches Association of America (NSCAA)/Adidas All-Star teams were announced recently. At the top of the list was senior co-captain Cara Glassanos (Hingham, MA/Hingham), who was named to the NSCAA/Adidas All-America Third Team. She was one of five New England players recognized among 33 players in the nation overall. Also named to the NSCAA All-New England First Team, Glassanos scored three goals and was the anchor of the Tufts defense this season. Head Coach Martha Whiting's team won the New England Small College Athletic Conference (NESCAC) championship and played in the NCAA Tournament for the third time in five years. Other Jumbos named All-New England on the women's side were junior defender Jess Lovitz (Fairfield, ME/Laurence) and sophomore forward Jen Baldwin (Medway, MA/Medway). Lovitz joined Glassanos on a Tufts back line that posted a 0.71 goals against average in 18 games. They were two of the three defenders named to the All-NESCAC First Team earlier this year. 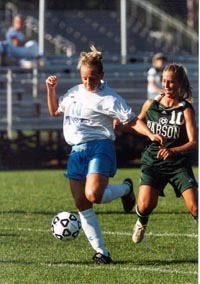 Baldwin led Tufts in scoring with 22 points on nine goals and four assists. She scored twice on penalty kicks in the NESCAC tournament and had two goals in a 2-1 first-round win over Connecticut College. On the men's side, seniors Garrett Dale (Upper Montclair, NJ/Montclair) and Matt MacGregor (Little Compton, RI/Middletown) were named to the NSCAA All-New England Third Team. Dale led Tufts in scoring for the second straight season with eight goals and one assist for 17 points. MacGregor was next on the scoring list with five goals and a team-high five assists for 15 points. They were both named All-NESCAC Second Team back in November. The Tufts men finished 9-5-1 and lost in the first round of the NESCAC tournament at Amherst. Both players were also named NSCAA All-New England last year, Dale to the Third Team and MacGregor to the Fourth.